What do the Service Dogs do? Learning to take off a sock. 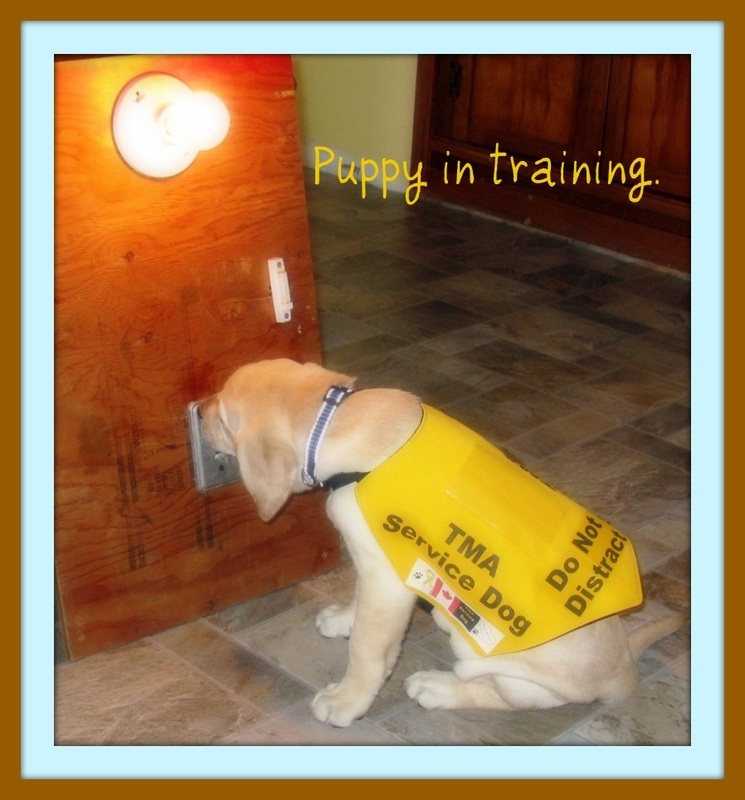 It is not uncommon to have a Service Dog trained to do between 60 and 80 or more, mobility task commands, such as opening doors, turning off lights, putting clothes into the washer and dryer, putting dishes into a dishwasher, picking up dropped items, helping to put clothes on and take clothes off, helping to transfer from a transfer board to a wheel chair, bed, etc. Dogs can be trained to assist someone with physical injuries, such as loss of limbs, balance problems due to health challenges or for individuals who suffer from spinal cord injuries, as well as many other forms of physical challenges brought on by injuries or illness. Mental Health Service Dogs can be a unique type of aid to promote wellness for individuals with emotional concerns or Mental Health Disorders, including Post Traumatic Stress Disorder (PTSD), Dissociative Identity Disorder (DID) and many other Mental Health Disorders. These dogs can be trained between 4 or five to over 80 commands that can help enable the individual to stay calm in high stress situation, and take control of their lives verses becoming out of control if an elevated anxiety situation, was to occur. When an individual is partnered with a Service Dog and a working union is formed the dog can be supportive and help an individual to become stronger in their abilities to function in a manner of greater independence, enabling them to overcome obstacles where other therapies may have been unsuccessful. To give you a better understanding of how a Service Dog can help with challenges that are associated with mental illness, please find below a short list of the tasks that a service dog can help with when an individual is feeling out of control. Please understand that this is only a limited list, and each dog is trained for each individual's requirements; with this understanding an individual may have unique challenges that are not listed below that a dog can help with. Reflex Sympathy Dystrophy (RSD), Dogs can prevent or reduce panic by creating enough distance for the situation to become tolerable, a very painful affliction, on a bus or in line or in the workplace from accidental bumps that can trigger excruciating RSD flare-up. Tasks that will provide a tactile distraction from disorder symptoms are useful in emotional overload situations. Call 911 if handler does not respond to cues that the dog gives, such as waking up at a certain time or not getting up after a seizure, etc. Assist Person to Rise & Steady Person, Different Kinds of Balance Support Work in Public. Depending on the situation a person can experience the loss of balance and require help, when usually they are able body. Alert Sedated Partner to the Cry of Someone in Distress such as their child or partner calling. You can also have dogs that are educated in combination training, which means the dog will work with two or more types of training modes, such as a mobility dog for someone who requires a wheel chair as well this individual may suffer from a brain injury, and would benefit from the use of a dog educated in Paramedical Service Dog training. A trained dog works on commands, and the educated dog learns to think on his own, and gives assistance without interactions from his handler. These dogs are not pets, but are remedial channels trained to improve quality of life and improve functional capabilities of their Handlers; and are vital medical equipment, medical aids as well as lifelines to their Handlers that depend upon them. Family Support is important in the recoveries of individuals with injuries. Families care for each other. When an injured person requires help and is dependent on family for support and assistance, it often affects his or her family. We understand that there are Programs offering help to the families but due to the fact that the family often becomes overwhelmed with the added responsibility of caring for an injured person, (even when outside help is being utilized) Service Dogs can help support the family by taking the burden of always having “to be there” to help a love one. Service dogs, can give the family members a breathing space. A service dog is able to do tasks with a wagging tail, and not talk back, nor become frustrated for asking - one more time. Service Dogs are not going to become embarrassed, frightened, or communicate negative emotions, when the injured person has an outburst.